The Sea Urchin Festival: Yum? Consider this another example of the widely held notion that the French will eat anything. In the seaside city of Sete, near to where we are staying, the town put on a two-day event called L’oursinade — which roughly translates as the Sea Urchin Festival. The notion that a person would want to eat the gonads out of a two-inch sea creature that appears to be one big mass of (sometimes poisonous) spikes is striking, but then we remember that the French also eat snails and frogs. This was the second annual edition of L’oursinade, and I believe organizers can fairly call it a success, given the hundreds of people who gathered at the Place Aristide Briand in Sete, lured by the promise of spiky creatures with (allegedly) delicious gonads. The full name of the event was L’oursinade de Thau — an oursin being french for “urchin” and “de Thau” being a clipped version of Etang de Thau — the name of the long stretch of briny water separated from the Mediterranean Sea by a narrow band of land — which has the city of Sete at one end. The Thau produces all sorts of marine creatures cultivated for human consumption. Also available at many of the booths run by mom-and-pop operations were oysters, mussels and shrimp taken from the Thau. But this day, those delicacies took a back seat to the sea urchins, given their rarity in much of the world, as well as their expense. I feared a riot when we arrived, a bit after 3:30 p.m. The sea urchin festival was going strong … but no sea urchins were on sale anywhere, which seemed like a major problem for organizers. One stand said they were bought out by the lunch-rush crowd, and that was that. A second appeared to have been abandoned. A third had up a sign suggesting more sea urchins would be available at 4. 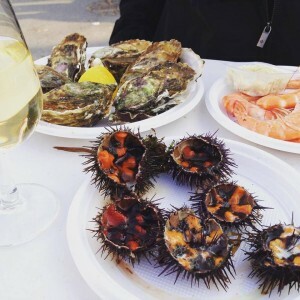 Since one of us was in Sete specifically to eat sea urchins, I suggested we camp out at the family stand run by Philippe and Simon, who have a shop in nearby Bouzigues … and wait for the urchin reinforcements. We were the first in line, but other urchin-o-philes soon joined us, and by 4:30 it was a crowd of perhaps 25 men, women and children jammed in front of the booth, looking for their urchin fix. At first, the proprietors said the next batch of urchins would be 15 minutes late. Then another 15 minutes. “Someone shouted, ‘You said 15 minutes 15 minutes ago! '” It was getting ugly. After a 40-minute wait … success! One of the guys in the booth wheeled in four cases of sea urchins slight larger than ping-pong balls, and as the urchins rolled by I think I heard the sound of salivating for the first time. As the woman in the booth had noted, during the chats of the long wait, she was the one who would have to prepare the urchins, which is tricky given that urchin spines are so sharp they can easily puncture human skin. She had on heavy gloves and also had a long, levered cutting device to separate the bottom from the top of each urchin — the bottom being the eating part, and in particular the five brightly colored gonads, which is the only part of the urchin eaten. We also ordered six oysters and six large shrimp, and that was dinner, pretty much. As others following us eventually emerged with their plates of urchins and met up with friends and relatives patiently waiting at the long tables set up in the place, often a shout would go up. “Urchins! At last!” They were heroes, for the moment. How does sea urchin taste? I do not know; I’ve gone this long without eating one, and I think I will stick with that. I am told sea urchins have a “smooth texture, almost melting in your mouth, and are a bit sweet and a little bit briny”. Six of them cost four euros, which I am told is nothing for sea urchins. We are told “urchin” is an old word for “hedgehog” — a land animal with spines. The typical English usage of “urchin” refers to poor and ragged street children. Which is why the nautical creature, in English, requires the further description of “sea urchin”. To the French, an urchin is a sea creature, and a poor and ragged street child is a galopin. Leaving the French free to eat urchins without guilt. The event was made more gay by the presence of several local vintners, and for a fee of five euros a visitor was given three tickets, each good for a free glass of wine from one of the regional producers (and the glass!). The Place Aristide Briand has a bandstand in the center, making it a fine place for musical acts to perform, and one of them did a rousing version of what must be some sort of French folk anthem from the 1960s entitled Santiano. Several of the wine-happy urchin-eaters jumped to their feet and danced to it. In all, an event worth attending. Local products, nice wine, real small-business men and women, a sunny, not-cold day, live music — and all the sea urchins a person could want, were he or she willing to wait.